VATICAN CITY (CNS) — In response to current scandals, clericalism and the need for reform, Catholic women must take the initiative and make their voices be heard, according to a series of articles in a Vatican magazine. “We wanted to give voice to a critical reflection from the point of view of women,” Lucetta Scaraffia, the magazine’s director, wrote in the opening editorial. 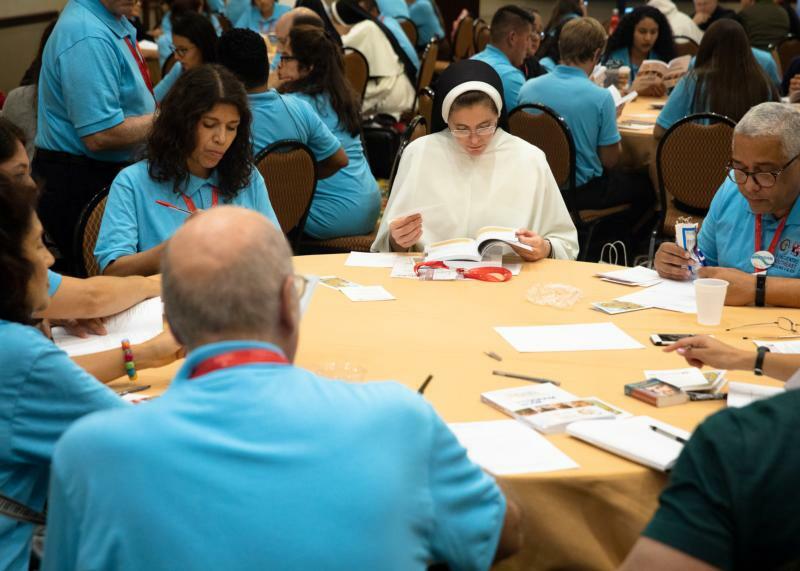 The first article, titled “Holy Rage,” was a Q&A with Sister Veronique Margron, a moral theologian who works with abuse victims, is president of the Conference of Religious in France and is provincial superior of the Dominican Sisters of Charity of the Presentation. Just being angry or upset about abuse is not enough, she said. “Courage is a virtue” and is needed to get people to do something about what they hear and know. Sister Margron spoke about the problem of abuse of power and conscience, which affects men and women equally. A kind of “incestuous environment” can affect a religious community, she said; it distorts and abuses the vow of obedience as one person puts another under his or her control. “When you enter religious life, you are trusting and your guard is down, something which is entirely normal,” she said. For these men and women who have given their lives completely to God, any act of abuse “gives rise to a tragic sense of shame,” so deep that it becomes impossible to talk about it. Christian life is built on faith, trust and promises, which is why suspicion is “poison for a community. The challenge is to establish procedures and checks, exactly for safeguarding the quality and decency” of relationships. Scaraffia, a historian, wrote in the article “Feminism and Clericalism” that women have to be given more leadership roles if their voices are ever to be heard or have any authority. “It is true that women, even the most obedient, do not truly feel part of the church, but at most (they feel like) obedient daughters,” she wrote. If they did feel they were a welcome part, then they would fight no matter what their role “with all the weapons they possess, which are not trivial things,” for the church to follow Christ’s teachings. But, she said, clericalism is also when the people of God sit at closed doors waiting to be called in. So often the absence of women in leadership or decision-making is not because of dogma or canon law, she said, but just deeply entrenched and outdated traditions. Anne-Marie Pelletier, a French biblical scholar who won the Ratzinger Prize for her contributions to theology, advocated in her article for a church guided by the “two voices” of all men and women. While recognizing there are women who are “ready to adopt clerical behaviors,” all too often it is women who see and experience the abuse of power in the church, in which the hierarchy is predominately male, she wrote. The church needs two voices, male and female, if the church is to “rediscover a truly evangelical intelligence of power as service” and for change to really happen, she wrote. It is not homosexual priests! How many of the abuse cases were homosexual and how many involved girls? Quite a number. Just because a man finds himself attracted to men doesn’t mean he has sinned or that he will. And abuse is not only in the Catholic Church – it is found in most churches. I believe having women to help with this problem instead of just the men “in charge”, would have found this situation dealt with long ago. What is clericalism? After scanning the article, I couldn’t find the definition of it. It’s the first time I’ve heard this term and I’m no youngster! As the liberals say, never waste a crisis to push forward your agenda! Sisters jumping on the #METOO movement… Please, spare us all the drama… We are all souls, male and female, not to be pitted against each other. The problem is homosexual priests, which should not have ever been ordained as it appears they were not able to maintain chastity, to which we are all called. Shameful, but not “clericalism.” Time to call it by it’s real name: homosexuality. This is more Vatican doubletalk to divert attention away from the root cause of the moral rot within the Church which is predatory homosexuality carried out by homosexual priests, bishops, and cardinals against innocent altar boys and male adolescents, seminarians, and young men. These sodomite priests, prelates, and their extensive cadre of sympathizers, cover up agents, and career fast track facilitators within the Church are a moral abomination. They should all should resign immediately or be forcibly expunged from the Church. For all those others within the Church religious who knowingly remained silent for years in the face of this evilness, especially high ranking religious, they too must share partial blame for their moral cowardice. As a first step in this cleansing process they should all come forward publicly, admit and take responsibility for their wrong doings, and ask for forgiveness. More deflection from the filth in the Vatican. The problem is not “clericalism.” That is absurd on it’s face. The problem is homosexual priests.